I must admit to having conflicted feelings when I see the new lambs in the fields at this time of year. With my urban sensibilities, it worries me that so new a creature with so little in the way of protection is outside in the British weather. Along with this overly mothering attitude, I also understand that many of them will not live out the year, and that my enjoyment of curried and roast lamb is at odds with my protective feelings toward them. And then there is the sheer gratitude that spring is here, embodied in the bright, gangling, fragile lambs. 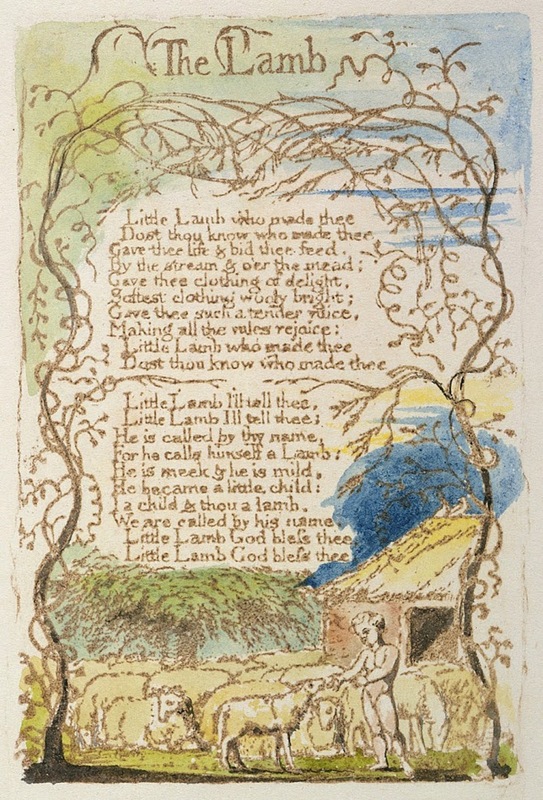 When I was a young child one of my favourite records included a version of the William Blake poem ‘The Lamb’ (Songs of Innocence and Experience) set to music by Carly Simon and her sister Lucy, rather surprisingly. Blake speaks of Jesus as a lamb and a little child. He assumes that his audience knows enough of Christian belief to understand that Jesus’ death on the cross was (for Christians) the climax in a long line of sacrifices of innocents. 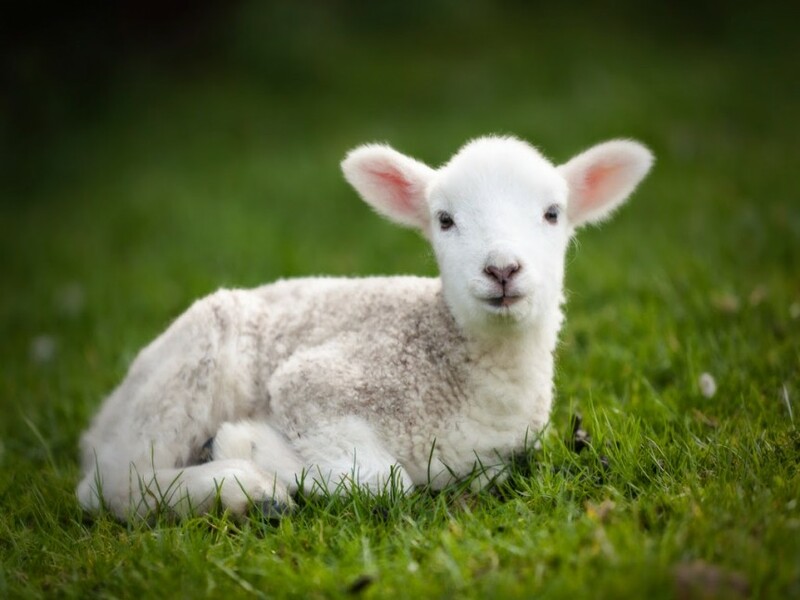 For thousands of years in many cultures, the lamb has been a symbol of peace, innocence and sacrifice. The purity and beauty of the lamb made the sacrifice valid. The animal had to be spotless for it to have enough worth to placate the deity. Lambs and sheep have an impressive portfolio of symbolic roles. 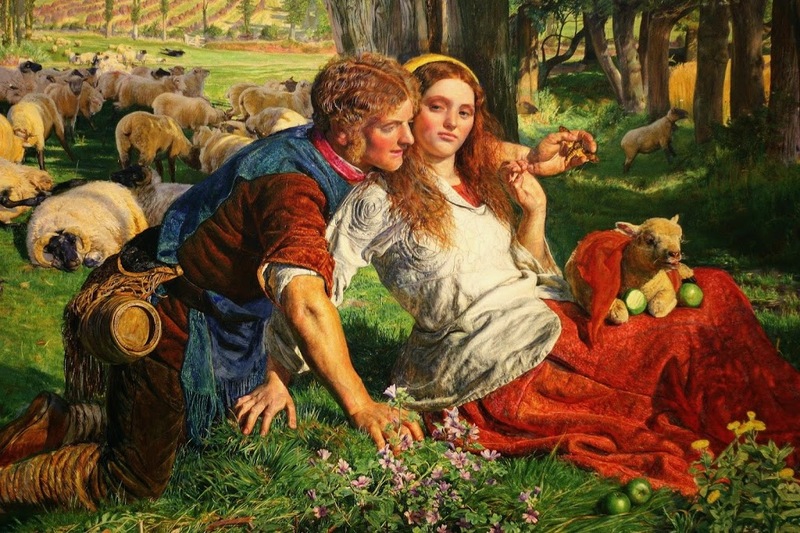 In the Pre-Raphaelite painting by William Holman Hunt, The Hireling Shepherd, the artist explores Jesus’ claim to be the good shepherd and not a hireling, who cares nothing for the sheep. In the painting the sheep are wandering just as much as the shepherd’s mind and hands. He attempts to seduce a shepherdess, who is distracted enough to let the tame lamb eat the apples in her lap (an allusion to giving into temptation) and the flock is beginning to eat the corn in the nearby field. Neither corn nor apples are good for sheep. Eating them can be fatal. (The Shepherd holds a Death’s-head Hawkmoth to show the Shepherdess. Controversial at the time due to its earthy subject matter, Hunt was forced to explain that the painting was allegorical, and was actually a criticism of neglectful pastors who did not instruct and look after their flock. In this painting, we the general public are represented by sheep and lambs. We, like them, need good leaders, not those distracted by their own pleasures and gain. We need leaders who will not allow us to walk blithely into our own ruin. As true now as it was then, in so many areas of life. Lambs carry quite a symbolic load, and all the while being one of the staples of our meat-loving diet, bred in their tens of thousands for mass consumption. But somehow the individual animals manage to supersede their singular purpose for living and their heavy religious duties. Through their exuberance, genial character, and their perfect fit in the landscape, they embody all that we hope for in Spring: energy, beauty and joy. like white washing fallen from the line. his long tongue cries, startling, loud. her call a deep bass bellow. drinking like a jack hammer. and later join the gang games of his peers. his folded ears will prick at strangers. that soft and supple shroud.